On Sunday, May the 20th, Grahame Davies took part in a poetry reading as part of teh art installation, the Museum of the Moon in the ruins of Tintern Abbey in Monmouthshire. The event was part of the Wye Valley Festival . The Museum of the Moon is an extraordinary lunar artowork by the international artist Luke Jerram. At nightfall, a combination of lunar images and moonlight brings the seven-metre-square sculpture of the Moon alive as it hangs suspended in teh Abbey ruins. The experience is accompanied by ambient sound by the BAFTA and Ivor Novello award-winning composer Dan Jones. Using NASA images, every centimetre of the sculpture represents 5km of the moon surface. 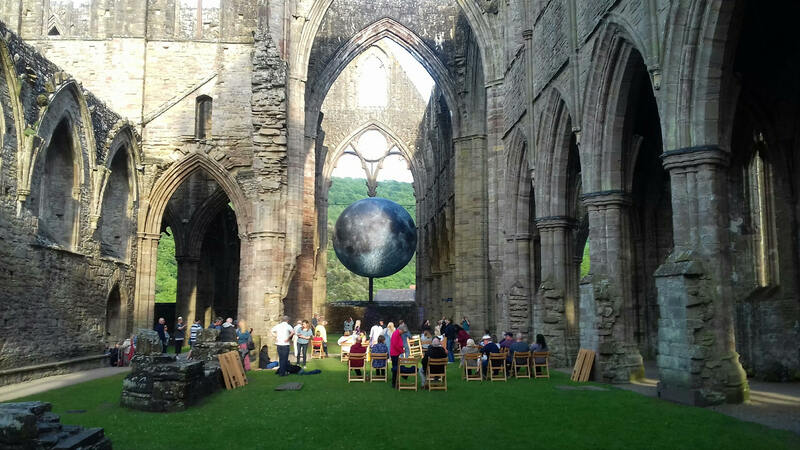 The Museum of the Moon was presented by in partnership with Cadw, in iconic Tintern Abbey as part of the Wye Valley festival from May 14-20 2018. The Moon has drawn visitors to Tintern Abbey int eh past too. After the Wye Valley railway opened in 1876, the Abbey became a fashionable place for people to visit to see the moon through the Rose Window of the ruins. With a sell-out audience of over 100 people, Grahame Davies read poems in Welsh and English about the Moon jointly with Vanessa Dodd and Helen Stott.